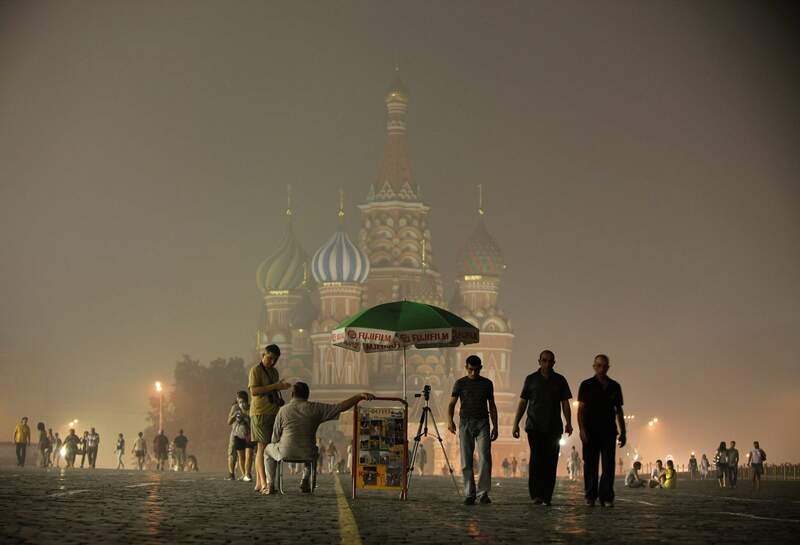 Moscow’s St. Basil’s Cathedral is seen through mist covering Moscow. Want to travel like the pros? Better start pinching your pennies, pesos and pounds. While it’s true that money can buy you an elite – easy, even – adventure anywhere, those who travel for a living genuinely enjoy the challenge of bargain hunting. Riding public transportation, couch surfing and sampling street food immerses you in the day-to-day life of any city – and that’s what traveling is all about, right? Live like a local“Budget travel” is a redundant phrase for Matt Kepnes, a travel writer who founded the site NomadicMatt.com and wrote “How to Travel the World on $50 a Day,” a bestseller. “I’m cheap, so it plays into my natural tendencies,” he says of his travel habits. More than 10 years ago, Kepnes opted to leave his cubicle job in hospital administration after trips to Costa Rica and Thailand gave him an unquenchable thirst to explore the world. Soon after, he launched his site and has continued earning his living by blogging about his travels. Exploring on a shoestring challenges him to live like a local – among locals. “I like budget travel because it brings you closer to the ground and more into the day-to-day life of the people who live in the place you’re visiting,” he says. 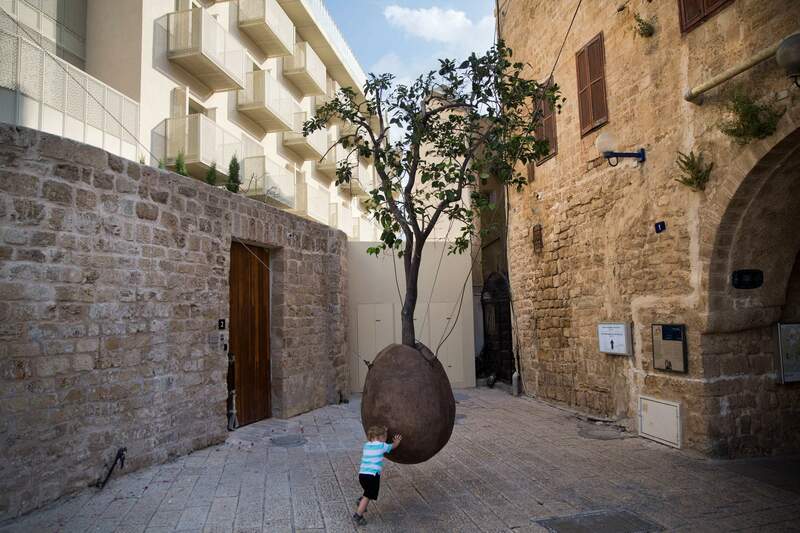 A child plays next to a 100-year-old orange tree hanging above the ground in the old city of Jaffa, Israel. Avoiding businesses within a five-block area of a city’s touristy areas is good way to get food for half the price, says travel writer Matt Kepnes. Be flexible with your destination. “If you’re dead set on going to Paris in the middle of July, you’re going to spend a lot of money,” Kepnes says. Whereas, if you’re open-minded about where you’re going, you can save big. Rather than committing to a city or country, shop the deals and choose accordingly.Avoid hotels. They’re expensive and also have a way of isolating you from the day-to-day rumblings of a city. “You’re not going to be in the room, anyway,” he says. Kepnes opts to stay in a hostel, crash on a couch or rent a room using home-sharing sites such as Couchsurfing.com or Airbnb.com. He has met many locals and travelers that way, and even received invitations to family dinners.Follow the “five-block rule.” Kepnes’ rule of thumb is to avoid businesses within five blocks of a city’s touristy areas. Just a few blocks farther, crowds disperse and prices drop. “You walk five or six blocks from any site, you’re going to get better food for half the price,” he says.Make your own breakfastAs the mother of two kids, cutting costs has always been on the mind of journalist Cindy Richards, especially when traveling. Today, she’s editor in chief of TravelingMom.com and TravelingDad.com, sites dedicated to family travel, and bargain hunting figures heavily into her job. She says the key to planning an affordable trip is to look for deals, but not at a sacrificial level. “I think the mistake that a lot of people make is they think that it’s budget, so it has to be cheap. And that’s not true. It’s budget, so you have to find deals is the way you should look at it, and there are any number of ways to do that,”she says. Choose your transportation wisely. Is it cheaper to fly or drive? Sometimes the answer may surprise you. Richards relies on BeFrugal.com, which has a “fly or drive” calculator that takes into account fuel costs, wear and tear on your car and hotel costs for driving vs. ticket costs, baggage fees, rental-car charges and more for flying.Make your own breakfast. Find a place with a kitchen, whether it’s a condo, house or hotel, and it can save you hundreds of dollars in restaurant bills. Richards recalls that when she took her kids out to breakfast while on the road, it almost always cost about $40. With kitchen access, you can buy a box of cereal and a gallon of milk (not to mention sandwich fixings) and you’re set. “You’re saving $40 a day for that,” she says.Do your researchFor John DiScala, founder and publisher of the money-saving site JohnnyJet.com, flying is a game, made up of bargain hunting and maximizing credit-card points. 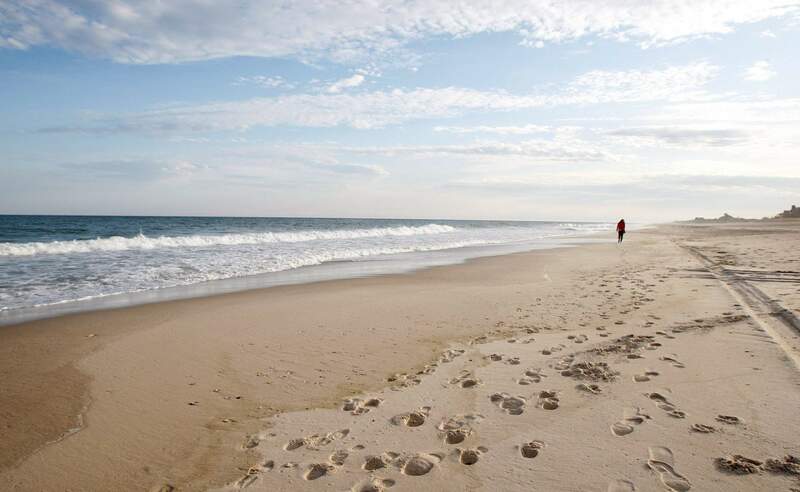 Coopers Beach in Southampton, N.Y., is No. 4 on the list of best beaches for the summer of 2018 compiled by Stephen Leatherman, also known as Dr. Beach, a professor at Florida International University. Being open-minded about your destination is an effective way to save money. Pick the credit card that will get you the most points. The right credit card for you will depend on your spending habits and how you want to use points. DiScala recommends Chase cards, such as the Chase Sapphire Preferred card, which offers a 50,000-point bonus if you spend $4,000 in the first three months and double points on traveling and dining.Research until you find the right deal. DiScala spends a lot of time scouring the web for flight deals. Recently, he was searching Google Flights for a business-class fare from Los Angeles to Miami, and saw prices upward of $1,200 one way. With more searching, he found a business-class flight from Los Angeles to Miami to San Juan, Puerto Rico, for just $365. He decided it was a good excuse to visit Puerto Rico, collect more airline miles in the process, then get a cheap ticket to Miami. That, he says, is all part of the game. “It just takes time. there’s not a website out there that will do it for you, so you just have to do your research,” he says. One forum that’s a good place to get insights on deals and making the most of miles and points, he says, is FlyerTalk.com.‘Thrill of the chase’In all of his travels, Cameron Hewitt has found that the more money he spends, the less connected he feels to the place he’s visiting. As content manager at Rick Steves’ Europe (ricksteves.com) and co-author of several Rick Steves guidebooks, Hewitt has traveled to and written about more than 35 countries in Europe. Frequently, the highlights were times when he relied on his wits to get around, rather than simply handing over his credit card. 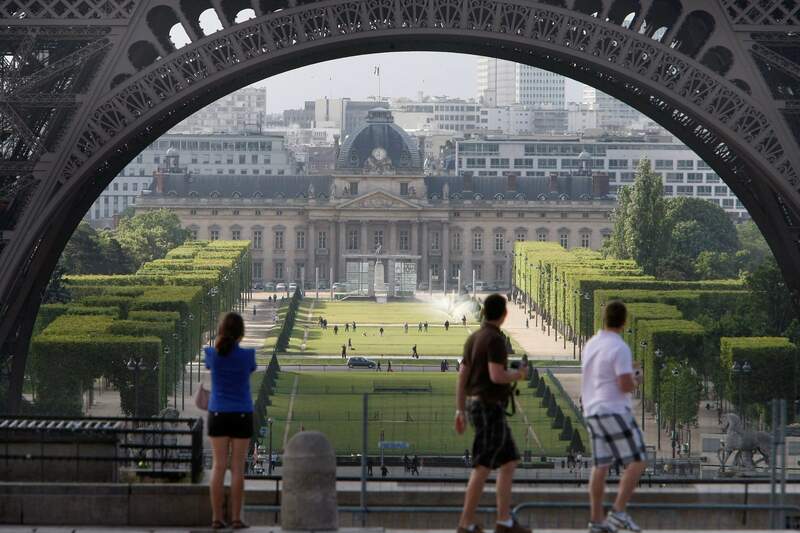 Tourists visit Trocadero square in Paris. Visible in background is the Eiffel Tower and the Ecole Militaire. Figuring out affordable ways to visit places can be fun, says author Cameron Hewitt. Take public transportation. Buses and trains are inexpensive, authentic and feel a little adventurous. While working on a guidebook about cruise-ship travel, Hewitt arrived at the cruise port of St. Petersburg, Russia, determined to find the cheapest way into the city. “I watched all of the other tourists hop into taxis and pay $25. Then I noticed a lonely bus stop a few steps away.” After a bus ride and a Metro ride, he quickly made it to the heart of the city for $2, while taxis were stuck in traffic. “It was faster, cheaper, and more memorable, since I was riding along with Russian commuters instead of complaining about traffic jams,” he says. “That’s just good travel.”For fast food, look to street food. Yes, there’s probably a Burger King or McDonald’s nearby. But pass it up and head for the hawkers. “Every culture has a cheap, delicious, filling dish that locals grab on the go: herring in the Netherlands, souvlakia in Greece, currywurst in Germany, zapiekanka in Poland, ‘Flemish fries’ in Belgium, Cornish pasties in Britain, and doner kebab just about anywhere in Europe,” Hewitt says. Not only is the fare cheap, it’s also a taste, literally, of that culture.